The Ohio University’s Hugh M. Culbertson chapter of the Public Relations Student Society of America (PRSSA) earned two prestigious national awards at this year’s PRSSA National Conference in San Francisco. OU’s chapter won "Best Campaign" for its student-run firm, ImPRessions, which is nationally affiliated with PRSSA. The Hugh M. Culbertson chapter also received a Teahan Award for "Best PRSA/PRSSA Relationship," as a result of its connections with public relations professionals in the Public Relations Society of America during the 2011-2012 year. This is the first time in years that Scripps PRSSA has come home with two awards. "I am unbelievably proud of the 2011-2012 executive board and very excited for our chapter at Ohio University. Having PRSSA national recognize our chapter on the national level is not only humbling, but a testament to how hard our members work," said President Allison Jordan. The 2011-2012 Generation Rx campaign, for Cardinal Health, earned the prestigious award for helping raise awareness for prescription drug abuse on college campuses. With only two awards given to 33 student-run firms nationwide, PRSSA and ImPRessions were proud to walk away with this accomplishment. Sponsored by Champions for PRSSA, the Dr. F.H. Teahan Chapter Awards Program recognizes the outstanding achievements of PRSSA Chapters in 12 categories each year. Hundreds of chapters apply for the Teahan Awards in hopes to be recognized at the National Conference in the fall. This is the second consecutive year Ohio University’s PRSSA chapter has taken home a Teahan. 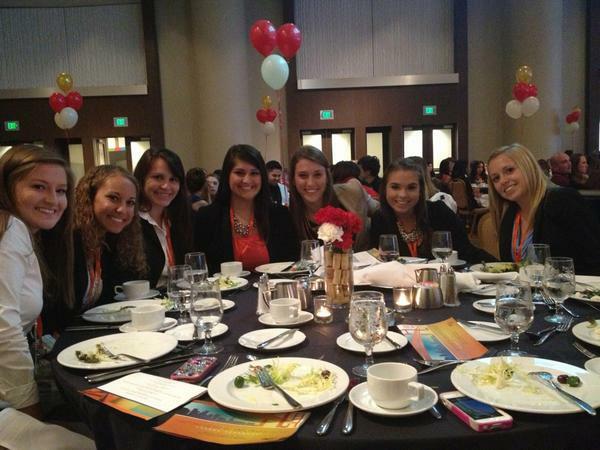 Samantha Tischler, Sienna Tomko, Elizabeth Krizner, Marisa Dockum, Nicole Spears, Cidnye Weimer and PRSSA President Allison Jordan flew to California on Homecoming weekend October 12 to attend the "Bridging the Gap" National Conference, hosted by PRSSA National. There are more than 20,000 members and 300 chapters across the country in PRSSA National. At the conference, there were over 100 chapters in attendance ready to network and attend industry workshops. Upon their return to Athens, the seven representatives were welcomed with quite a homecoming of their own. They are excited for what is in store for the 2012-2013 year and hope this impressive trend continues.